With a view to keep the environment clean and green, the Punjab Police launched an aforestation drive by planting more than 50,000 trees at various Police lands in the State which include premises of Punjab Armed Police (PAP), Indian Reserve Battalion (IRB), Police Stations/Police Posts/Police lines etc.Disclosing this here today a spokesperson of Punjab Police said Director General of Police, Punjab Suresh Arora and other senior police officers posted at Punjab Police headquarters today planted tree saplings here at Police headquarter premises. Interacting with officers on the occasion Arora said all district chiefs and commissionerate officers have been asked to involve all the ranks in pursuing the 'Tandrust Punjab' mission envisioned by the Chief Minister Captain Amarinder Singh. 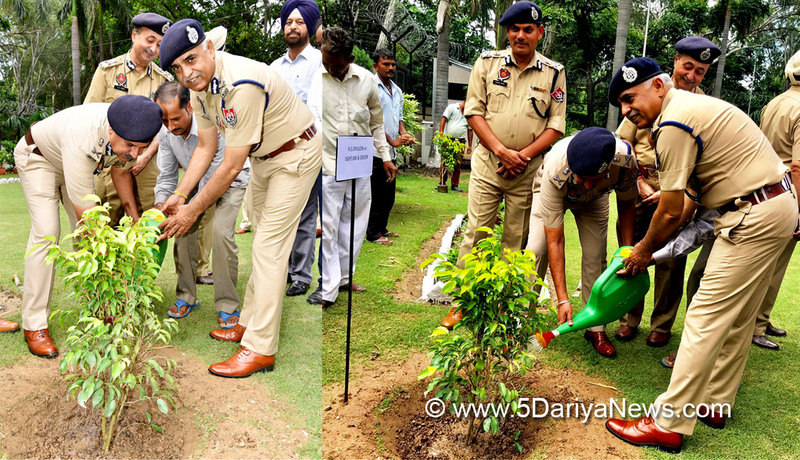 "The plantation of trees will be an ongoing drive by various units of state Police", he added.Giving details DGP Arora informed that Shweta Dhruman Nimbale wife of Dhruman Nimbale, AIG (Intelligence) Punjab, has mooted an idea to launch tree planting drive in a recently held meeting of Punjab Indian Police Officers Wives Association (PIPSOWA). He added that the state Police acknowledges and appreciates creative suggestions and sensitivity of an activist regarding protection of environment. "Any such creative suggestion on socially relevant issues from members of Police force including their families will always be welcome"